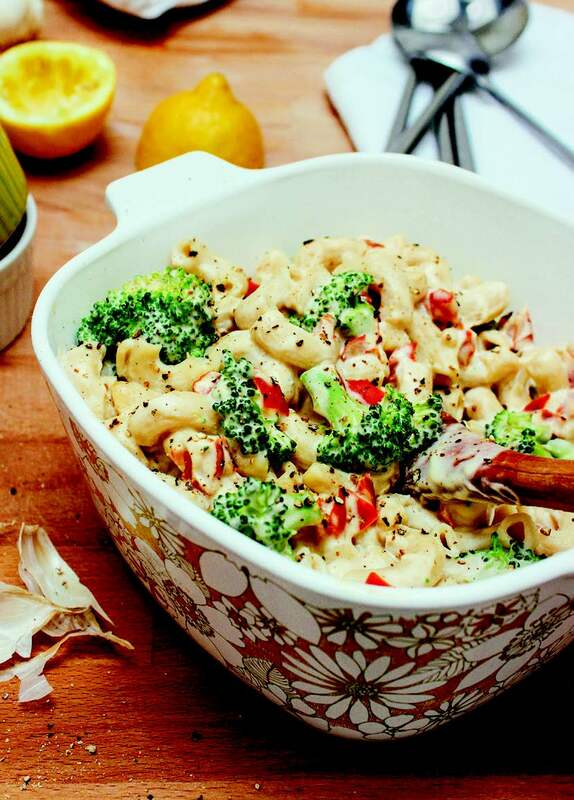 Creamy Broccoli and Red Pepper Macaroni from Yum Universe, werved with spinach salad and chopped tomatoes. Guess what just came in the mail? One of the nice things about being in the publishing world is that not only do I get to rub shoulders with some of the best authors in the business, but I also receive lovely gifts such as fresh-off-the-press books for review. This brings both of us a distinct advantage. I, of course, get to see the books right out of the gate, so that I can report back to you. 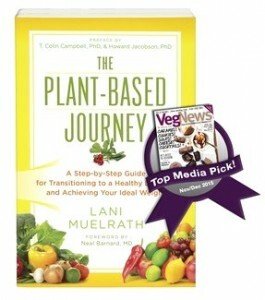 And you have the advantage of early peek as well as an opportunity at winning the book giveaway! 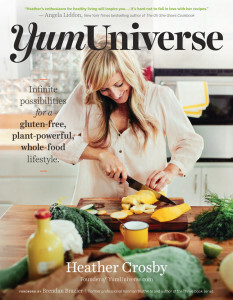 The latest book to cross my doorstep from the publisher of The Plant Based Journey, BenBella Books, is Heather Crosby’s delectable YumUniverse: Infinite Possibilities for a gluten-free, plant-powerful, whole-food lifestyle. 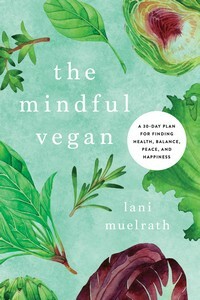 Primarily a plant-based cookbook, this gorgeous gem in paper binding is rich in beautiful photographs, interesting graphics, and tips and advice for plant-based living. Heather is decidedly enthusiastic, gregarious, and colorful – and it all comes across in her book in stunning and energetic visual display. Broccoli and red peppers are sauteed before adding to the cooked macaroni and adding the sauce. I tossed in some mushrooms, too. Which recipe should I make first? After browsing through the book, exploring recipes and other content, then came the task of deciding which recipe to make and report back to you about. 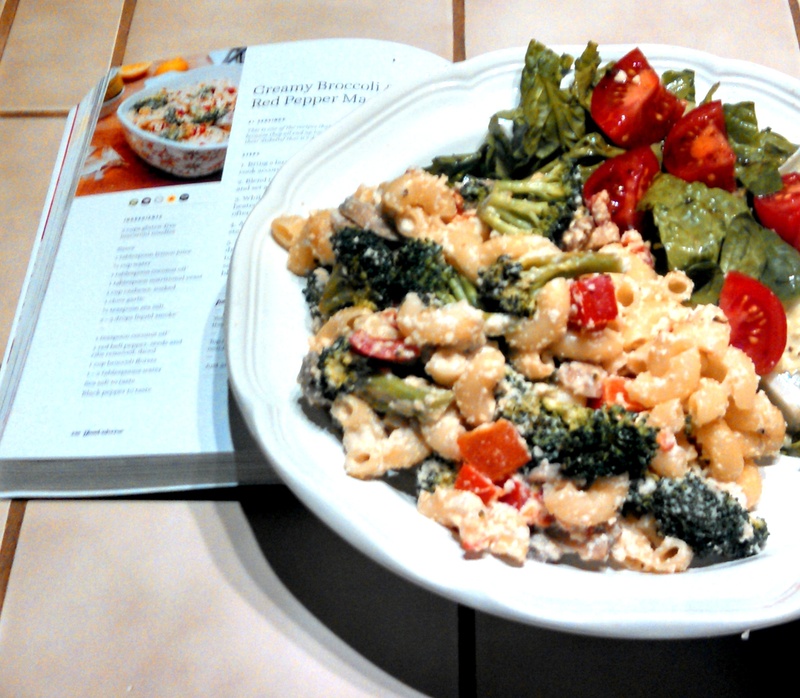 I decided on the Creamy broccoli and red pepper macaroni. First, because it looked absolutely delicious in the book photo (see photo from the book below) – the cheese sauce used in this ‘mac and cheese’ style recipe is just about an exact match for what I’ve made before as sauce on pasta, grains, vegetables – you name it. Yet the presentation with the bright green broccoli and the red peppers (a personal favorite) were too inviting to pass up. Besides, hubby Greg adores all things pasta (he’s Italian) just about as much as he loves potatoes in any shape or form (he’s human). This dish did not disappoint. It’s perfect as at home comfort food yet also would be an obvious choice for potlucks, get togethers, or guest night. The recipe called for coconut oil, yet made it clear that this was optional. I just replaced it with a splash of vegetable broth. It also called for gluten-free macaroni (one of the themes of the book is gluten-free) but I went with regular wheat macaroni. I also found that the rich sauce looked like it was going to go a lot further than the suggested amount of noodles and vegetables, so I halved again the macaroni, doubled the broccoli, and tossed in some mushrooms, and it was still well-sauced and plenty flavorful. This is a highly addictive salad thanks to the kick, the crunch factor, the freshness, and the lovely colors. It’s easy to prepare and holds up in the fridge for a few days if you have leftovers. 1. Bring a large pot of water to a boil. Add noodles and cook according to manufacturer’s instructions. 2. Blend together all sauce ingredients until smooth and set aside. 3. While noodles cook, place 1 teaspoon coconut oil in a skillet heated to medium and add diced red bell pepper. Stir often for 7 minutes. 4. Add broccoli and water to skillet, stir, cover and steam for 3–5 minutes. Remove from heat. 5. Return to the noodles. If they’ve finished cooking, drain and rinse and return them to the pot. Mix together cooked and rinsed noodles, veggies, and sauce over medium heat. Season with fresh-cracked pepper and more salt to taste if necessary. psst! 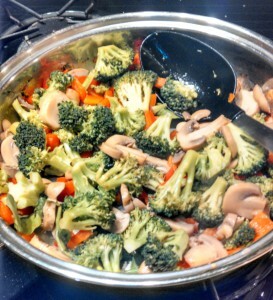 Swap mushrooms for broccoli, or add mushrooms to the mix. You can use applewood-smoked salt for the salt called for in this recipe if you aren’t using liquid smoke. Top this recipe with Almond Crunch Kale Chips (in the book) for a healthy non-breading texture that’s outta this world. Heather has quite a robust website with lots of resources and features. You can find out more – and snap some valuable book pre-order bonuses – by visiting her at Yum Universe. 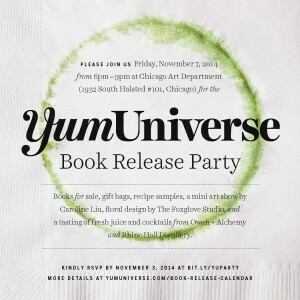 And if you’re anywhere near Chicago, you must pop into her book release party that sounds like it’s going to be a smash! Multiply your chances to win by quickly completing entry tasks! Post your response to the question below in ‘replies'(required), and give a thumbs up to connecting on facebook and twitter (if you have already, simply check ‘yes’!). What is you favorite plant-based, Fall comfort food? You can enter through Sunday, November 2 – the winner will be selected on Monday, November 3rd. Thanks for playing along, and I can’t wait to read your replies! SWEET POTATOES!! No prep even necessary. Cook and eat, cold or hot. The perfect snack food. Thanks Jodie for getting things underway! Since we’re already connected on fb and twitter, be sure to check those off too! My favorite Fall plant-based food would be “Roasted Veggies”…..especially butternut squash, yams, red & green peppers, mushrooms, with some garlic Yum! OK Cindy, now you have to tell your roast method. Roasted veggies always sound so good but I’m such a lazy cook I never seem to get it done. What’s your secret? Potato Soup would be my favorite fall comfort food, or a good veggie bean chili with cornbread!! I loved mashed potatoes mixed with lots of chopped basil, water sautéed garlic, steamed kale, and corn, using veggie broth to make taters creamy! Very yummy! My favorite fall food is Delicata squash. I just halve it, scoop out the seeds, andpop it into the electric pressure cooker in a steamer basket and set it to 10 minutes. After a 10 minute natural pressure release, it’s done. It’s sweet and delicious without anything added. Add some steamed veggies and you have a quick, colorful and healthy meal! Barbara – what is Delicata squash? I thought I knew all me squashes! They are sort of an oblong shape, mostly yellow/gold colored with a few green streaks and are on the smaller side (I can eat a whole medium sized one easily). I think they have a somewhat short season, as I don’t see them all winter long in the market like the other winter squashes. 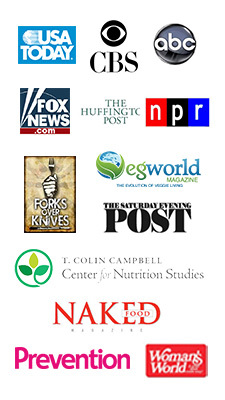 My Whole Foods carries them, although I see them occasionally at farmer’s markets. I also love root veggies! Try this baked colorful layered root veggie dish. Round up your favorite root veggies, including beets. Using a food processor, peel then shred in color order (beets on the bottom of the pan): beets, carrots or sweet potatoes, turnips, parsnips, rutabaga. Layer in a lightly oiled 8×8 or 9×13 pan, dark to light, with beets on the bottom layer. Splash some apple juice or apple cider on top, and add salt and pepper to the layers as you build this. Bake in a 350 degree oven until tender. The color is beautiful, and the taste is wonderful! Geez Cynthia, I’ll be right over! I am totally making this! Holy can’t get enough of it – I am thrilled to get so many easy and delicious ideas for preparing fall veggies! Keep the ideas coming, thank you everyone! My very favorite fall recipe, hand down, is Peanut Pumpkin Curry Soup. Omg, yes, it’s amazing! In a soup pot heat the oil, add the onion and garlic. Sauté until softened. Whisk in the pumpkin, cayenne, curry, peanut butter and broth. Bring to a boil and then reduce to a medium-low simmer for 20 mins, or so. Stir occasionally and prep your garnish. Pull off heat and let cool slightly, at least 10 mins. Whisk in sour cream and lemon juice (don’t add them until you’ve allowed the soup to come down a bit from its boiling temp). Serve with garnish and enjoy. Also, to make it almost fat-free, I soften the onion and garlic in veggie broth instead of coconut oil, and I use organic powdered peanut butter instead of traditional peanut butter. Still just as yummy! I am definitely going to try this…thanks Christine! Half of a roastedsquash stuffed with quinoa, cranberries, and pecans. My favorite fall comfort food is mushroom barley soup. Roasted squash, any kind, but especially Butternut! And of course, what is a day without a sweet potato – roasted with salt and pepper. Sweet potatoe – baked. What could be better. My favorite fall food is pumpkin oatmeal!!! Sweet potatoes are my favorite food for Fall. They are so versatile! My favorite is a tie between pumpkin and sweet potatoes. I actually eat both year round. Mix about 1/2 cup Libby’s 100% pumpkin with 1/2- 3/4 cup almond milk add 1 Tbs brewer’s yeast, 1 Tbs uncooked rolled oats, 1/2-1 tsp cinnamon, and 1/2 tsp ground ginger. YUM!! I go a bit heavy on cinnamon and ginger. I have this for breakfast on mornings when I don’t have to run out the door at 5am with my smoothie. Butternut squash is my favorite fall comfort food. Thanks! Any type of lentil soup with corn bread and sweet potatoes. 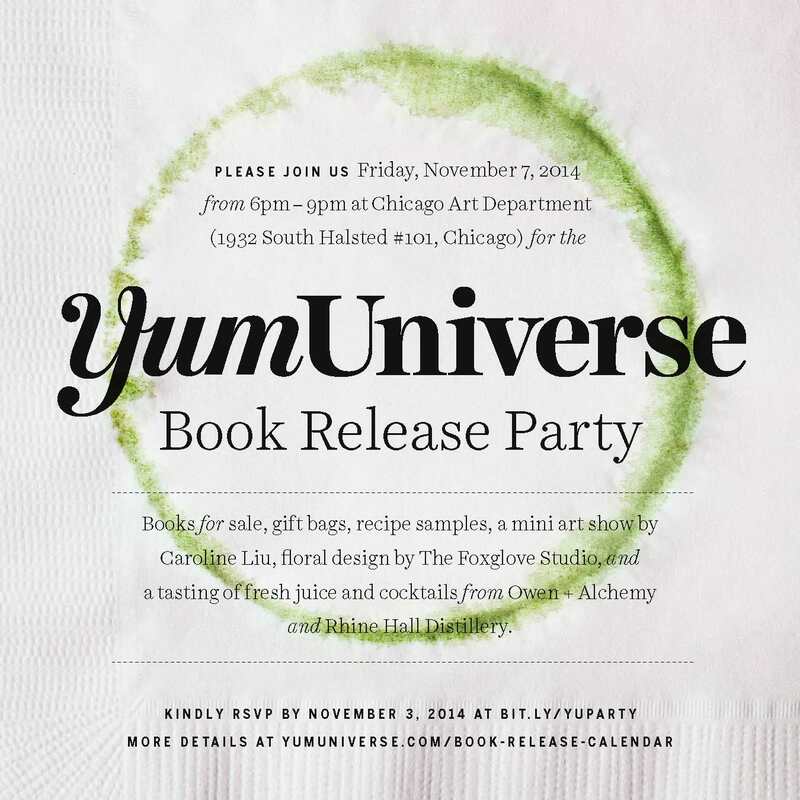 Going to miss that book release in Chicago by one week! Will like on Facebook, but don’t do twitter. Like so many others my favourite fall comfort food is roasted root vegetables.. adding fresh rosemary and thyme along with a bit of citrus flavour. yum! My favorite Fall plant-based food is probably about any kind of soup (lentil, sweet potato black bean chili, corn chowder, etc.). I eat soup any time of the year, it just tastes better when the weather gets cooler. I eat sweet potatoes year round, so they don’t count. My new fall favorite is delica squash. They are oblong, with dark green and pale yellow lengthwise stripes. I cut them into rings, about an inch and a half wide. Scrape out the seeds. Place them on a cookie sheet with parchment paper (you don’t even have to peel them! ), and bake at 450 for about 15 minutes, till they start to brown. I eat them plain, warm or cold. So good! I’m looking forward to 3-bean chili for fall! Santa Fe Soup. A family favorite that I altered to make it vegan. No one has noticed the change. Love the ideas and wow, hard to narrow it down to a single favorite! Even though I live in south FL where fall is more a concept than a reality, the sun and daylight changes still trigger the innate feeling of fall and “winding down”, and the produce departments reflect it too. I cook for only me though, so though I tend to favor quick and easy…and cheap! LOL! Having said all that, my go-to comfort food always seems to revolve around a warm bowl of old fashioned oatmeal, with various additions like ground flax, cooked squash or pumpkin (lots of it!) warm spices like cinnamon, ginger, cardamom, etc., chopped fruits like apples, peaches, pineapple, whatever, maybe a sprinkle of nuts or raisins or dates, whatever is on hand will do! Never fails to satisfy! I always make a big pot and then put leftovers on top of another stand-by…baked sweet potatoes, or else I stuff baked squash. Yum! To avoid the temptation to nuke stuff and make sure something nutritious, quick and easy is always available, I usually set aside a bake-athon day and fill the oven with time consuming bake-ables to have at the ready, it really helps all around! I just steamed a big batch of butternut squash chunks and then a big batch of gorgeous bright green dinosaur kale, all grown nearby. I will mix a little miso, tahini and nutritional yeast into mashed squash and mix the kale into that. Yum! I love sweet potatoes and roasted veggies, but come fall, I know it is time to make hubby’s favorite White Bean and Basil soup from Robin Robertson’s Quick Fix Vegan. I make a large pot, but it never lasts very long! When the weather gets even colder, then it’s time for a green chile stew! I’ll answer before I read anyone else’s. My very favorite fall comfort food dish is chili served with rice, polenta, quinoa, or potatoes. Chili is so versatile. I love the beans, and I changed them every time. I love adding sweet potato or roasted squash, greens or olives. It’s different every time. And it’s best with cashew sour cream on top. That makes it extra special. In cold weather I love to eat vegan soups, and chili. The best chili recipe ever (plant based) served on mashed roasted sweet potato sprinkled with vegan faux parmasen and vegan sour cream Yum!!!! I love broccoli in creamy pasta dishes. This one looks like a winner. Thanks for sharing!! I’ve been eating curried lentils with brown rice all month, so that must be the one! I so enjoy a recipe from Vegan Italiano–Cranberry Beans (borlotti) with Rosemary. I use fresh rosemary that grows prolifically in my yard, and lots of garlic. Yum! Favorite fall food is apples…crisp, pie, salad and with p’nut butter. My new favorite is…first I have to tell you I love sweet potatoes. But I have always had them, well, sort of sweet, as in sweet potato souffle, or baked with cinnamon and ginger. But lately I have found a new way of eating them..sweet potato, chili beans (chili) and broccoli. Oh my! It may not be new to some of you, but I have never heard of eating them this way. Mom thought I was crazy! Mine is roasted cauliflower soup. So easy and so tasty. Split pea soup is my fall comfort food. I love the aroma filling up my house. My go-to fall favorite is Moroccan Vegetable Stew! Thick, savory soup and homemade bread! Hot, mouth-satisfying, belly-filling Moroccan Stew with Fresh or Pomi tomatoes, large hunks of sweet potatoes and eggplants and chickpeas and yummy spices, a combo of middle-Eastern and Indian! With some raisins thrown in! Serve it hot over brown rice or with crusty sourdough bread or whole wheat couscous! It has recently turned cold here and I am comforted with butternut squash soup. I love the vibrant color, the smooth creamy texture, and the taste excites my taste buds. Thank you for posting this drawing, Lani,you are wonderful! My favorite has to be squash soup – any kind – I like it spicy with pepper and garlic added, I could eat bowl after bowl! Fave Fall comfort food…sweet potatoes and butternut squash! Almost any veggie will do though, and I’m really embracing the greens (less sugar potential) vs higher carb foods these days! Forks over Knives Cookbook has a delicious Curried Butternut squash Soup, one of my favorites! I think I already follow you on FB and will add Twitter. My favorite Fall food is anything with pumpkin and butternut squash! Especially in a hot bowl of soup. My favorite fall food is roasted root vegetables with onions, garlic and either liquid aminos or balsamic vinegar. I like so many fall veggies … I recently tried pumpking “french fries” which I made in the oven … 1000 x better than original french fries! I love spaghetti squash many different ways. Sometimes with just a touch of salt, marinara sauce, or tomatilo salsa. I love a whole head of roasted cauliflower. Simple, elegant and delicious. My favorite fall plant-based comfort food is acorn squash baked with apple slices and a bit of cinnamon. My favorite fall food is soup!